Dulax (locally The Dulax). Two corries. Da, being a dual word, takes a noun in the singular, but in post-Gaelic times s had been added to dalag to make it plural. Afterwards gs had lapsed into x. 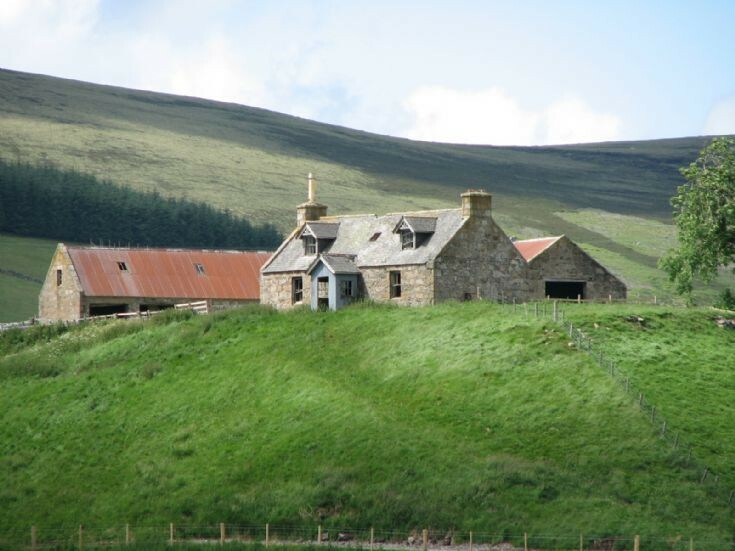 The farmsteading of Dulax is no longer in use and is in danger of falling derelict. The buildings appear to be those depicted on the 1st and 2nd editions of the OS 6-inch map (Aberdeenshire 1869 and 1903, sheet l) and comprise a one-and-a-half storey farmhouse accompanied on the NW by an L-plan steading with a horse-engine platform to the rear. The principal living room of the house contains what appears to be a large arched fireplace 2.65m in width by 1.4m in height and 0.25m in depth, but its detail is obscured by the timber lining of the walls of the room. Two of the bedrooms contain box-beds, and a cheese-press has been built into the exterior of the W gable of the house. Visited by RCAHMS (PC, JRS), 12 November 1998. Probably early 19th century, altered early 20th century. Single storey and attic, 3-bay, small farmhouse sited on steep hillside overlooking Glenbuchat, with catslide-roofed bedroom outshot at rear, cheese press incorporated into W gable, dormerheads incorporating overhanging eaves, plain bargeboarding and decorative timbering, and remarkable retention of original interior. Simple L-plan steading to NW also retaining much original interior detail. Coursed and squared rubble, some snecked, with squared rubble long and short quoins. S (PRINCIPAL) ELEVATION: symmetrical. Small gabled porch to centre with part-glazed boarded timber door behind, windows in flanking bays and dormer windows above with cast-iron rooflight at centre. N (REAR) ELEVATION: low outshot to right of centre with narrow opening immediately to left and windows to outer bays. W (STEADING) ELEVATION: cheese press built into wall at outer left. Remains of 4- and 6-pane glazing patterns in timber sash and case windows. Grey slates. Coped ashlar stacks; ashlar-coped skews and small block skewputts. INTERIOR: fine example of standard Donside layout with original interior in place including `breast of plenishing with box beds, fireplaces to ground floor rooms, that to kitchen with large opening (see Notes) and swey; boarded timber dividing walls, linings and wall cupboards; timber-balustered staircase. Description Single storey and attic, 3-bay, small farmhouse sited on steep hillside overlooking Glenbuchat, with catslide-roofed bedroom outshot at rear, cheese press incorporated into W gable, dormerheads incorporating overhanging eaves, plain bargeboarding and decorative timbering, and remarkable retention of original interior. Simple L-plan steading to NW also retaining much original interior detail. Coursed and squared rubble, some snecked, with squared rubble long and short quoins. W elevation contains a cheese press built into wall at outer left. Dulax, along with Badenyon and Upperton, was advertised in the Aberdeen Journal for let by public auction, with entry at Whitsunday 1816. The current house exhibits all of the early features seen in both Glenbuchat and Strathdon (Skellater House Cottage, Bellabeg House, West Tornahaish and Mains of Glencarvie) but the exterior was probably reworked during the estate improvements instigated by James W Barclay in the opening years of the 20th century.